Originally Stacy was a hurdler but she was recruited to Yuba College by coach John Orognen and trained for the heptathlon. During training the coach encouraged her to jump over six feet something Stacey found quite terrifying. Stacey graduated from Idaho State University with a degree in Physical and Heath Education. During her career she has achieved the 2000 Olympic gold medal, 1999 World Champion, 1997 World Outdoor Champion, US Outdorr Champion for four years, Us indoor champion between 1996 and 2001 and the 2000 Jesse Owens Award Winner. Stacy is now studying for a Masters in Health Education; she works as assistant coach with the Idaho State track team helping out with the pole vault and the heptathlon. Having pushed herself to break really tough records, Stacey is a true sporting hero. Pole Vault 4.81 2001 LOCATION? Pole Vault (Indoors) 4.? ? LOCATION? 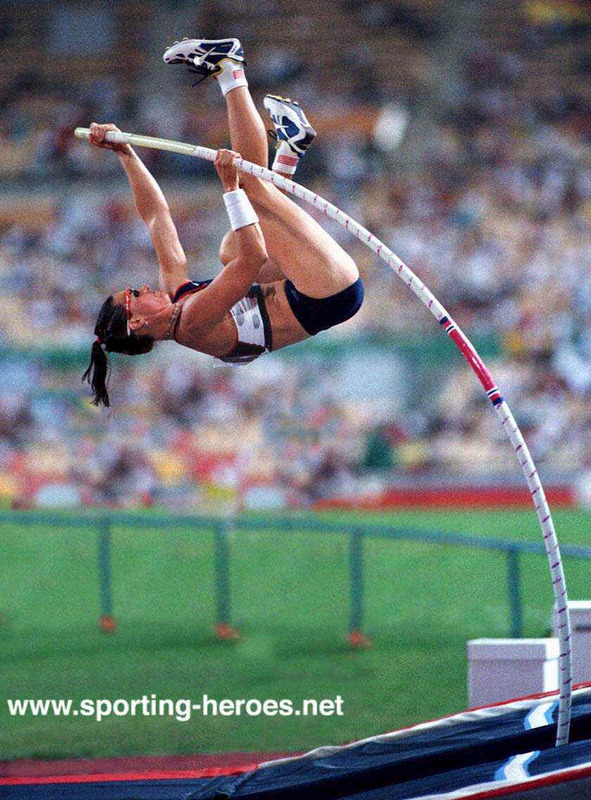 Dragila originally ran the hurdles but after a stint at training for the heptathlon, she was encouraged by her coach to try the pole vault and has dominated the event ever since. Stacey won the World Indoor Pole Vault in Paris. Stacey won the World Championships in Seville. 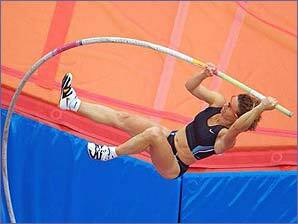 Stacey won the Olympic Pole Vault in Sydney. Stacey broke the World Pole Vault record on 9th June with 4.81m. Svetlana Feofanova and Stacey Dragila both failed with their third attempt to clear a world record 4.82m. As a consequence America's Stacy Dragila retained her world title and Feofanova, who loses due to an earlier miss, wins silver. "American Stacy Dragila held on to defeat plucky Russian Svetlana Feofanova in a superb women's pole vault duel at the World Championships. Dragila, a massive favourite coming into the competition, was pushed all the way by her rival, who easily surpassed her own personal best. The competition, perhaps the most enduring of the field events so far, ended with both competitors warmly embracing. Both women came into the competition with the bar at 4.35 metres and cleared each height attempted until 4.65. Dragila, the world and Olympic champion and world record holder, failed her first attempt at the height but cleared the next. 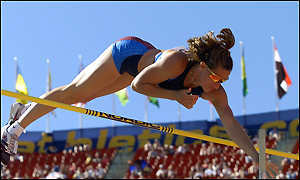 European record holder Feofanova failed twice at the same height before clearing with her third attempt. Both women went clear at 4.70 and 4.75 before the bar was raised to 4.82, a centimetre higher than Dragila's world record set in June this year. They both missed with three attempts each, giving Dragila the gold on the countback." Svetlana Feofanova set her second world indoor pole vault record within a week at a meeting in Stockholm on Wednesday 6th February leaving former record holder Stacy Dragila, of the USA, well behind in second place. And the Russian hinted that she could vault still higher by criticising the event runway. "The runway was not entirely stable and I wasn't quite myself in it. I don't think Stacy was able to adapt to the runway either." The American cleared 4.47 before failing at 4.57. Double defending champion and reigning Olympic champion Stacy Dragila of the United States was out of the medals in fourth place at the World Championships in Paris. Svetlana Feofanova cleared 4.75m to equal the championship mark of Dragila from two years ago. Olympic Champion Stacey Dragila (USA) took the silver medal at the World Indoor Championships Pole Vault with a vault of 4.81, after Yelena Isinbayeva's 4.86. Stacey Dragila was down in 3rd as Yelena Isinbayeva broke the world pole vault record for the third time this year on British soil at Crystal Palace on 31 July. Svetlana Feofanova, who had held the record at 4.88m, responded by having the bar put up to 4.95m but found the challenge literally too steep despite almost hysterical support from the enthralled crowd. The trio will do battle at the Athens Olympics.